We are honored to have been featured in several blogs, magazines and websites. Over the past 10-15 years the cycling industry has come a very long way. The study of the science behind cycling aerodynamics and the body's response to cycling has grown exponentially over this time. 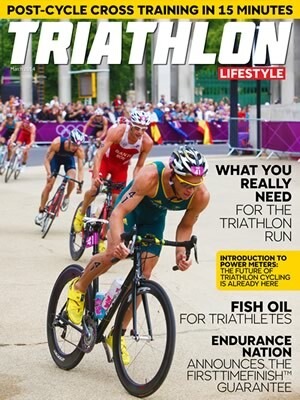 It can be argued that the rise of triathlon has been a primary reason for this explosive growth. Heart rate is a great way to analyze an athlete's effort level on the bike. However, the issue with heart rate is that there is a physiological lag associated with both hard and recovery efforts. If you push hard up a steep hill your heart rate will climb higher but it is delayed. Meaning you will not know your real effort till after you have put in the work. A power meter on the other hand gives a rider an immediate response to the rider's work. So as you start to climb that steep hill your power will spike up correspond to your actual effort level. Considerable research has been done with great success to correlate a cyclist's power output to optimal effort zones for training. Unlike heart rate, power is an instantaneous response measurement so when training in a particular zone a rider has direct feedback as to the level of effort for a particular training interval. As triathletes and coaches collect and review the athlete's power data training programs can be better tailored to account for fatigue, races can be analyzed to determine strengths and weaknesses, and progress can be easily measured and understood. New research is showing that power data can also be used to very accurately advanced race day planning and execution. How do power meters work? Power meters come in several flavors, but all operate roughly the same way. Tiny strain gauges measure the torque (or force) on a riders pushes though either the bike’s crank, pedal, or wheel (depending on the type of power meter you have). Power is then calculated using a simple formula. While the details are interesting the most important thing to note is that power meters accurately measure your effort level regardless of the type of rider you are. So if you push a hard gear at a slow cadence or an easier gear at a very high cadence the power meter will still report an accurate number. To make use of a power meter you need to pair it with a compatible cycling computer or watch. Most power meters on the market conform to a standard data connection called Ant+. This allows you to use a Garmin watch or any number of existing cycling computers as your main data display. Power meters are still relatively expensive, but the potential for training and racing gains are huge. One option that may help ease the transition to training with power is to find an indoor cycle studio that uses indoor power trainers. These trainers allow you to do tests to determine your training zones or even pre-race a course without having to own an actual power meter. The first step to start training with power is to perform an initial FTP (Functional Threshold Power) test. This test is typically done as a maximal effort 20 minute all out ride (preferably in an indoor controlled environment). The average power output is often multiplied by .95 to get an approximate average power for a one hour time trial. This number sets a baseline for future test comparisons a rider’s specific training zones. Another benefit to using power over heart rate, is that as a rider advances through training their FTP numbers will increase and training zones will adjust. Typical training zones are shown below (along with their correlation to effort level and heart rate). One question that age groupers often ask that always perplexes (and sometimes annoys) triathlon coaches is, "what will my finishing time or bike split be." This is of course a loaded question that is often impossible to answer as every course is different the conditions can very greatly from year to year. That being said, new research has recently been conducted to look at the ideal power levels to average during long distance races that will still give the rider "fresh legs" for the run. Traditionally this data was analyzed post race to see why things went well or what went wrong in a race. No new tools are allowing athletes to use this race and training data to pre plan race strategies for future races. Cycling more so than the other two disciplines in triathlon can be modeled very nicely mathematically. Without getting into too much detail given data about a rider, cycling equipment, race course, and race day conditions math models can now not only predict a riders bike finishing split but also give power instructions to the rider on how to achieve this time while still being as fresh as possible for the run. The next wave of innovation in triathlon is here and power meters are leading the way. What is Best Bike Split? Our math and physics engine takes your power data, course info, and race day conditions to predict your race performance and create the perfect power plan so you can hit your best bike split. ©2019 TrainingPeaks, LLC. ALL RIGHTS RESERVED.